Pima County Food Alliance is taking part in a national study, conducted by Active Voice, to better understand what it takes to address hunger, obesity and food insecurity, and we’d like your help to get a better picture of what people know about these issues in our community. We would like to ask for your participation in this Community Study by completing two time-sensitive steps at this time. STEP 2 – We also ask your help in sending the email below to members of your network and community listserves, including any residents of your community, within the next 48 hours (SEE DIRECTIONS BELOW). This may include sending an email blast to your online contacts and/or posting the link on your social media feeds. The more widely spread it is the better. Please see directions below on disseminating this survey. About the Study: The Take Your Place (TYP) Community Study involves 24 communities across the U.S. where at least one free screening of the film “A Place at the Table” is being held this summer or fall. Participation in the Community Study consists of completing three brief questionnaires over an 12 to 16 week period. Each questionnaire will take about 10 to 15 minutes to complete. Participation is voluntary and your responses are confidential. If you have any questions regarding the Take Your Place Community Study, please contact Active Voice Research & Evaluation Manager, Dina de Veer at dina@activevoice.net or 415-487-2000. 1) Copy and paste ALL of the text from this blog post into a new email. 2) If you need a graphic, feel free to use the image below. On a more serious note, did you know that one in four kids are hungry in America? The Pima County Food Alliance is taking part in a national study, conducted by Active Voice, to better understand what it takes to address hunger, obesity and food insecurity, and we’d like your help to get a better picture of what people know about these issues in our community. About the Study: The Take Your Place (TYP) Community Study involves 24 communities across the U.S. where at least one free screening of the film “A Place at the Table” is being held this summer or fall. Participation in the Community Study consists of completing three brief questionnaires over a 12 to 16 week period. Each questionnaire will take about 5 to 10 minutes to complete. Participation is voluntary and your responses are confidential. Have you ever noticed those pools of water, shimmering in the afternoon sun over Avra Valley, west of Tucson? You can see them from the lookout at Gate’s Pass, and they’re an odd site, here in the desert. If you’re like me, you may have wondered what they are. Fortunately, I can now explain. To do that, let me back up a little. Arizona has, for most of its history, relied primarily on groundwater, a practice that has long been recognized as unsustainable. Tucson has suffered many well closures and water table decreases due to Tucson’s once exclusive dependence on groundwater. This is especially true for central Tucson. From the inception of The Central Arizona Project (CAP), state politicians have been vying for Colorado River appropriations. 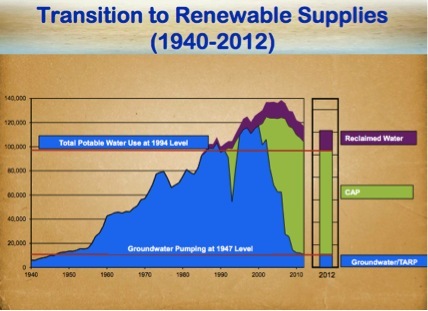 In the aftermath of project approval, Arizona was forced to demonstrate that it would actually reduce groundwater use. Thus, the Groundwater Management Act of 1980 emerged, which created the Arizona Department of Water Resources and legislated an innovative and comprehensive water management plan that continues to impact Arizonans today. Five geographical areas with a historically heavy reliance on groundwater were defined and subject to regulation pursuant to the groundwater code. These areas—known as Active Management Areas (AMA)—were based on projected population growth and key groundwater basins, rather than the political lines of city, towns, and counties. Each AMA has its own set of water management goals and the Tucson AMA aims to achieve a “Safe Yield” by 2025. The Safe Yield objective is to maintain a roughly equal balance between groundwater pumping and groundwater replenishment, thus protecting groundwater from overdraft. In 1992, upon the completion of the CAP canal, Colorado River water was introduced directly to Tucsonans practically overnight. Hydrologists had not adequately accounted for the differences between the two types of water and did not anticipate the effect it would have on the existing infrastructure. The water chemically reacted with pipes, resulting in brown water coming into many people’s homes. Upset Tucsonans passed local legislation in 1995, the “Water Consumer Protection Act” banning Tucson Water from directly distributing CAP water to customers, and requiring that CAP water characteristics match groundwater qualities. Tucson Water had to develop an acceptable way to utilize its newly acquired CAP water. The answer to this conundrum was to let CAP water filter down into the ground where it could mix with the existing water in the aquifer before being pumped back up. To accomplish this, Tucson Water established 20 “recharge” basins at three sites where water is stored above ground and allowed to percolate down. 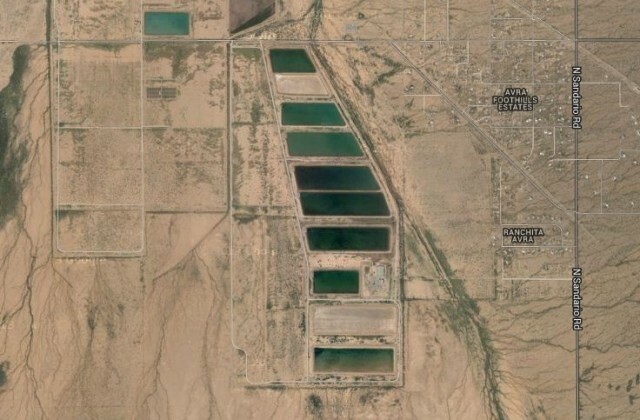 The project, known as the “Clearwater Program,” cost about $400 million to build, covers 500 acres, and allows 46 billion gallons (140,000 acre feet—Tucson’s full allotment) of CAP water to recharge annually. Two of the sites are in Avra Valley, which explains the shimmering water visible from Gate’s Pass. The other is on Pima Mine Road. Although per capita water use in Tucson has steadily declined, with population increases, the demands on water resources remain significant, potentially doubling by 2050 according to Tucson Water projections. The good news is that in the meantime the CAP recharge basins have allowed the water table to recover some, rising about 1.5 feet per day. The average depth to which the water percolates is 350 feet below ground, although in some places, where the water table is very deep, wells have been dug to 1000 feet. The basins also function as water banks to meet legislative requirements of maintaining an adequate amount of water. Tucson Water then pumps out the blended water from different areas of Tucson for delivery to customers. Tucson finally has enough infrastructure to capitalize on nearly 100% of its CAP allotment, compared to 2011, when Tucson Water was only using 60% of allotted CAP water. Looking at Tucson’s total water use, recharged CAP water now accounts for approximately 75%, with groundwater, reclaimed water, and miscellaneous sources making up the rest (2012). Although aquifer levels have increased in certain areas, many argue that reliance on CAP water is only a temporary fix in the current drought environment, especially with the Colorado River, the West’s most critical source of water, facing record low flows. In fact, new measures are being taken by the federal government to curtail water deliveries to some areas. In addition, the Colorado River Compact has set Arizona as one of the first states to be denied water, should the river shortages continue and water become more restricted. Whilst our water providers assure us that Tucson’s water portfolio is diverse enough to sustain our population in times of severe water shortages, and maintain strategies and conservative measures to reduce water use, water is an undoubtedly finite resource that needs multiple strategies and approaches to sustain itself for our community’s future. Are you a food justice advocate? If so, share this flyer! If you haven’t heard about this free film-screening, you must be lost in your overgrown zucchini patch. 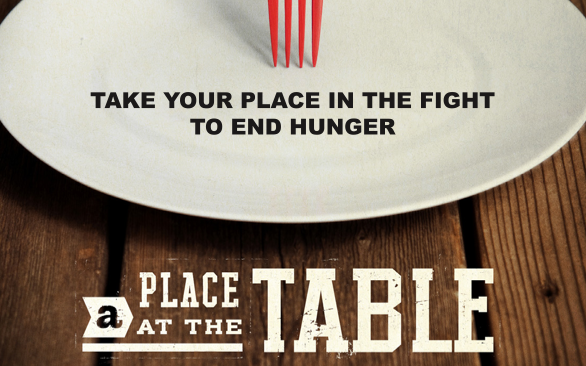 We’ll be screening a very thought-provoking film called “A Place At the Table” later this month and we need your help promoting it! Please download this flyer and share it with all of your friends. For more details, see our original post.